Did you know that ants are over 100 million years old? It all begins long ago when the flowering plants begin to bloom, and the ant, as we know if evolved from a long-ago wasp-like relative. Since then ants continue to develop into many species, a total of 22,000 species have been recorded. They cover almost every landmass on Earth, so there is no escaping the small wasted, elbow shaped antennae, ants we know today. But there is a way to get rid of them. Take a look into the history, and present day, story all about ants then learn how to find an exterminator in Phoenix. Ants join together to work in a large group of ants called colonies. This group of ants can range from a small colony of twenty, living in a small-enclosed area, to millions of ants in one huge colony. Depending on the size of the colony, the ants each have different responsibilities to contribute to the team. Larger colonies have a group of workers or soldiers, typically the females. All of the colonies consist of males and a female queen. All of the ants in the colony work together as a team to harvest and gather food. How Do Long Do Ants Live? Colonies can last for hundreds of years. Each ant of the colony, worker queen, males, all have a specific life span. Did you know that a queen ant lives for as long as 30 years? Considering the worker ant lives only one to three years, and males only a short three weeks, the queen lives much longer than her colony, or other insects of her size. For ants in colder climates, the colony works less and reduces activity to survive the temperatures. Ants can be a real trouble to get rid of because of their size and migration. Ants can easily find their way into your home by bridging from the walls, plants, trees, or any other objects around the home. The first step is to find the source of the ants where their home is, what is around your home that is attracting them? The typical treatments used by pest control companies include baiting the colony and using non-repellents. This will leave the ants thinking that there is food to find, or to bring traces of the non-repellent treatment to the colony because it cannot be detected by smell. If you are looking for a consultation to rid your home and outdoor areas of ants or to find out more information about ant exterminating, contact Varsity Termite and Pest Control. 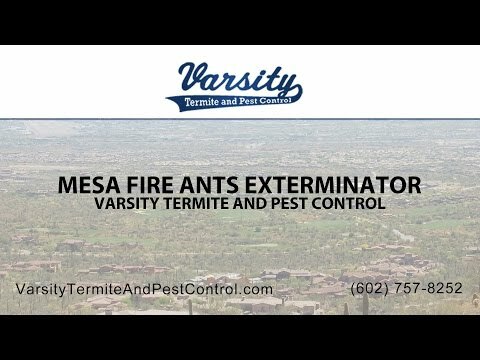 Our professional Phoenix exterminators have the knowledge and products to rid you of all ant infestations or any other pest issue you might come across.